Temple of Hephaistos. 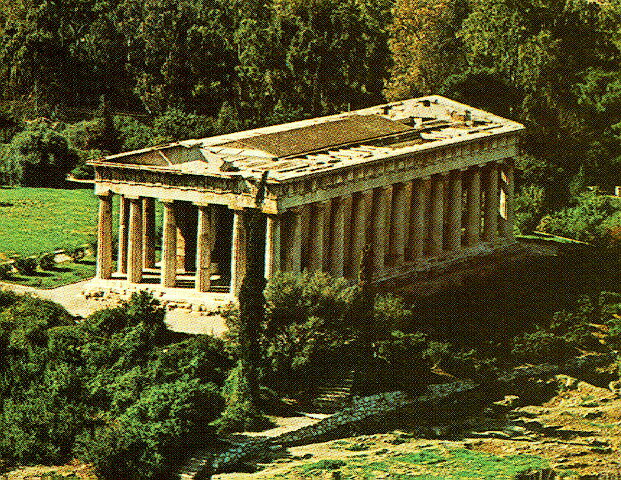 The temple, known as the "Theseion", is Doric, peripteral, with a pronaos and opisthodomos. It crowns the hill of Kolonos Agoraios and is the most prominent and better preserved monument of the Agora. The temple was dedicated to two gods, Hephaistos and Athena, whose bronze cult statues stood in the interior. The construction of the Hephaisteion started in 449 B.C.